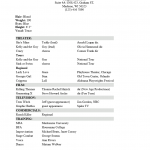 The Acting Resume Template is a must have tool in any actor’s arsenal. Opportunities in acting are highly time sensitive and incredibly competitive. This is an industry where focus and immediacy are paramount in any inquiry regarding a role. Whether one is answering an ad by sending in a resume and headshot or if one must respond immediately to a casting call, the hopeful actor is responsible for a resume that will be not only memorable but outshine others. In addition, this resume must contain mainly information only relative to the role whenever possible (unless they are a beginner). 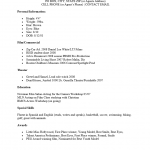 There are several types of actor resumes and while they may differ slightly they must all be accompanied with a headshot and must all contain some essential information. 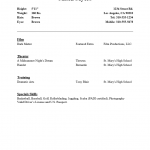 This information is divided into categories and most of the information on an actor’s resume must follow a very specific format. Typically, they are Contact Information, Stats, Experience, Skills, and Education/Training. Certain formatting liberties may be taken with the Name, Contact Information, and Stats however all three absolutely must be present at the top of the page. The Experience must be divided by category, must follow a specific format, and must have certain content. For instance, people make the mistake of trying to fill this section up with everything they can think of. Do not do this. By example, you may have only had a few speaking roles and a multitude of extra work. It’s easy to think that adding the extra work will ‘bulk’ up the resume and thus, make you look like a professional however the exact opposite is the case. The Skills section is a place where you can be creative and list as many skills that you are proficient at as you like (even being able to wiggle your nose noticeably on command). Finally, the Education/Training Section will conclude the resume. This final section can be a deceptively important one, since a significant amount of acting jobs are attained through networking. Remember, the goal of an actor’s resume is to gain an audition and having a school in common with a CD may be quite helpful. Of course, the best way to get an audition is to actually get your information to that director or CD relatively quickly. You can have the best resume in the pile but if it gets there too late or is the very last in line for review then the best resume will not do much good. This means that your turnaround time must occur as quickly as possible without sacrificing quality and a template can easily achieve this. 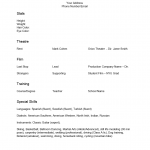 By using the Acting Resume Template, the format is already present and most of the content is set. For instance, you may have had quite a few speaking roles in both comedies and dramas and you are going for a comedic support role. It makes little sense to send a resume where the reader must pick out through a multitude of non-relevant roles. However with the template you can simply copy and paste from a main document into the appropriate area. Thus, avoiding time consuming formatting issues or accidentally overlooking something. These can both be bypassed by being organized and prepared thus, increasing one’s chances of gaining an audition. Every Actor needs to send in a headshot and a resume in a set way. This is why an acting resume must be one page. It must be stapled to the back of a headshot and the edges of the paper should be trimmed carefully with a pair of scissors. When stapling, use only two staples in the top left and top right corner.